A lot of gear comes with extended zipper pulls. Our experience is they usually fail and break off, aren't velcro friendly and don't have reflective qualities. 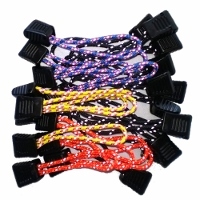 Get ready to retrofit your gear with the most advanced zipper pulls on the market today. We build them right here in Seattle using top grade hi-test reflective nylon cord and grooved pull tabs for better gripping. They can be retrofitted to zippers on luggage, boots, jackets, pants, vents, tents, sleeping bags and anything else you can dream of. And because they use reflective cord you'll be able to spot things easy in the dark. Beyond your motorcycle gear, consider these for a great way to identify your luggage when it comes down the carousel at the airport. Installation is easy using our simple to follow instructions and can be done in seconds with no special tools required. If it has a zipper, make it easier to find and get at with our exclusive Sound RIDER! Hi-Viz Zip E-Zs. 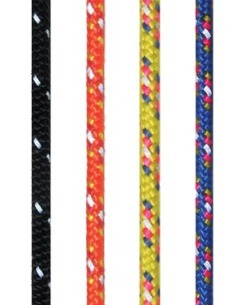 Available in the four colors shown - black, orange, yellow and blue. Select from packs of 5, 12 and 25 per color. NEW - Get a hold of our 24 piece combo set (shown at left) that includes an assortment of 12 black, 4 orange, 4 yellow and 4 blue Zip E-Zs. Tip - Use bright colors for primary zippers and dark for lesser used zippers. This is really handy on tank bags and tail packs where multiple zippers are near one another.